It’s interesting that within the past couple of months two professional historians have released books that contextualize their own family histories into the broader Australian story: one by Emeritus Professor Graeme Davison, and the other by a young historian, Nick Brodie. I heard and very much enjoyed Nick’s paper at the recent AHA conference (in fact, I awarded it my ‘Packer’s Prize’ for the best paper). He struck me as a particularly enterprising and forthright historian and just the sort that television producers would be looking for: young, good-looking, articulate, intelligent. (As an aside, I note that his book is marketed by SBS….) I’m interested to see how these two histories compare, written as they are by historians born forty years apart and at the two extremes of an academic career. Opposite the preface is a family tree tracing the family trees of Nick’s four grandparents (Pa and Nanny, Grampy and Grandma). It is clear from the start that this is going to be a personalized history, and Brodie himself often ambles onto the stage, sharing his excitement at finding a particularly quirky document, or treading the paths of a country cemetery along one of Australia’s highways, generally under the beating sun of an Australian summer. In this regard, the book captures the experiences of any keen family historian. But the author and his book, are more than this. The questions that arise when reading any small-focus history – whether it be of an individual, an organization, a street- are “is this exceptional?” and “what does this mean?” Brodie is well placed to answer both, and he does. In doing so he at times confirms, at times challenges the big broad-brush, popularly received histories of Australian settlement. The book proceeds chronologically, and each chapter commences with an extract from his family tree, honing in on particular individuals. The watermarked graphic behind each chapter heading resembles the oak tree icon in the UK version of “Who Do You Think You Are?” and each chapter is, in effect, a contextualized story of a particular individual. The branches on his family tree reach back to the convict era and they rustle loudly during the gold rush and post-gold rush migration decades. Its final chapters are strongly influenced by war as the structure becomes rather more event-based, with chapters divided into years. By now, the four grandparents have emerged as eyewitnesses and oral history informants and the final chapters intermesh the varied experiences of the four people. Because Brodie is following the documentary trail of his kin, certain documents and events predominate. He makes reference in several places to the word-searches that he has conducted on Trove and newspaper reports feature heavily in his history. So, too, do the events where private life becomes drawn into the spotlight of the courtroom with all its associated documentation. His kinfolk emerge into the public record, then subside into shadow again, marked only by birth-dates and death-dates (and sometimes not even that). As a researcher, when necessary he moves laterally, using the writings of contemporary observers and he uses mass-data mining techniques of word frequency counts to weigh the significance of particular events. At times he reflects on the artefact itself: his handling of a photograph, for instance, leads into a reflection on the process of nineteenth century photography and the significance of folds on a much-handled family photograph. He makes good use of episodes, breaking into a quasi-fictional imagining in his retelling: his narration of coach-driving and the Boer War experience for Australian soldiers is particularly well-done. If he is sometimes distracted by irrelevancies (e.g. the botched hanging of the aboriginal warrior Dundalli in Brisbane in the 1840s; the finding of a letter in a bag of Euroa flour by a Belgian soldier in April 1917) they are, it’s true, stories and incidents too fascinating to let slip by. So, how does his own, particular family history illuminate the bigger picture? The differing experiences of two convict branches of his family highlight the lottery-like nature of transportation; cattle play a much larger place in this history than sheep do; it’s a largely rural story even though most of Australia’s population clustered along the coastline. Indigenous people did not ‘disappear’ but came into contact with ‘ordinary settlers’ through proximity on a frontier which was often (but not always) contested. Sectarianism co-existed alongside mixed marriages. ‘Rural’ life was more than just sheep or crops; livelihoods were both threatened and enhanced by railways and economically Australia was integrally tied into the Pacific trading network. This is a very confident book that teeters, at times, on brashness. It is written for a popular audience and although at times he mentions particular works, the text has no footnotes or references at all. Part of a historian’s task, as with any writer, is making you, as a reader, want to go along for the ride. In this regard, I found his sneers at “historians” grating and gratuitous (I was reminded of Two Fat Ladies’ disdain of “vegetarians”), especially as Brodie himself is a historian. I felt that such a pugilistic approach under-cut, rather than bolstered, his own authority. But, that aside, the book is a damned good read that talks back to popularly-received history and enriches it. 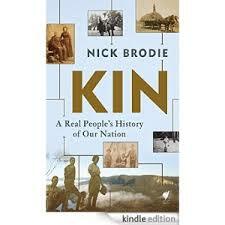 I have just started reading Kin, which I bought at the Sydney Writers Festival on the strength of seeing Nick Brodie on stage alongside Tom Griffiths and Mark Mckenna. I find myself bristling somewhat at what you describe as his brashness and pugilistic approach, so thanks for your review which I found useful. I’m going to keep reading. He’s young, I remind myself, and needs to make his mark. It’s tough out there. Thank also for your link to Davidson’s book, which I’ve had on my list. Thank you for commenting. Davidson’s book has a very different tone.